Sir Walter can now be seen in close to 700,000 yards across the country with over 75,000,000m2 sold since its introduction in 1996. Sir Walter has always carried the tag, “a lawn for life” and this has been proven time and time again. The original source was Buchanan Turf supplies, Mr Brent Redman’s turf farm in the Hunter Valley area of New South Wales. Mr Redman recognised the potential of this new buffalo variety and immediately took steps to protect the purity and integrity of this grass. It has been proven that buffalo lawns in Australia can open and/or cross pollenate with other buffalo varieties and original purity can be lost. With so many buffalo types now on the Australian market cross pollination is common, especially with some turf production areas producing many varieties. What we have learnt is that Plant Breeders Rights (PBR) protection does nothing to protect the consumer over cross and open pollination, and there was little being done to ensure the long-term genetic purity of turf production in Australia. In 2016, Lawn Solutions Australia (LSA) growers adopted AusGAP Certification. An overarching quality control and certification program that was introduced to the Australian turf industry to improve production processes, business compliances and turf quality. AusGAP adheres to the turf industry principles and guidelines as provided by the international program on turf purity – ITGAP. AusGAP is helping to protect the quality and purity of Sir Walter and ensures consumers can purchase the grass now and into the future with confidence in its origins. To take this to the next step, Lawn Solutions has introduced another level of consumer protection for the Sir Walter DNA certified turf they buy, known as the Sir Walter Original Breeder Guarantee. As of 2018, all Lawn Solutions Australia growers are required to regularly submit their Sir Walter DNA Certified back to AusGAP for testing against the DNA fingerprint of the original foundation material. The results of these tests are to ensure Breeder Certification. This is provided by Brent Redman and confirms the current 2018 Sir Walter DNA Certified will also be Breeder Certified against original Breeder foundation material. This Sir Walter foundation material has been managed in a clinical fashion since 1996, free of cross and open pollination and contamination. This is Australia’s only true foundation plot of Sir Walter to be maintained to AusGAP and ITGAP standards. LSA members submitted their Sir Walter for DNA testing in 2015, but genetic purity of a grass variety can be lost over time, as has been seen with Greenleas Park Couch, Wintergreen Couch and some new Kikuyu’s. The 2018 testing used the latest DNA testing technology available, was undertaken in accordance with ITGAP and AusGAP protocols and exclusively tested against Brent Redman’s foundation material. All the samples that were submitted for identification came back as a positive match to the original source material from Brent Redman’s farm. 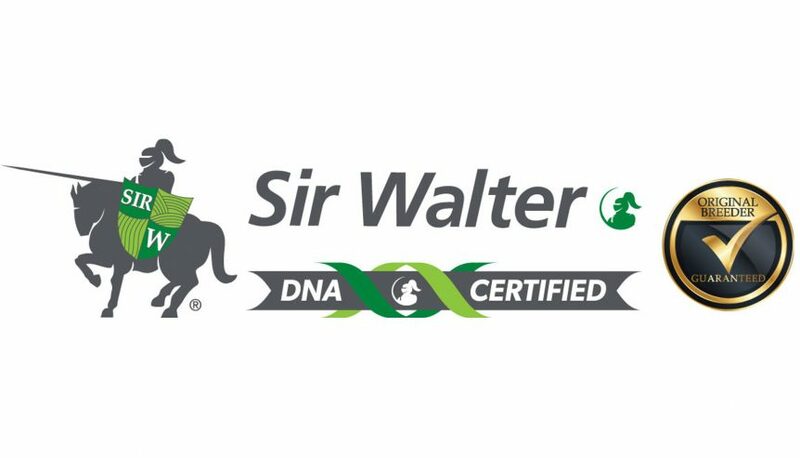 From this program was born the new brand of proven purity and quality, Sir Walter DNA Certified – Breeder Guaranteed. This process will be repeated periodically moving forward to ensure ongoing compliance and purity. There are turf growers outside of the Lawn Solutions Australia group who have not undertaken testing of their Sir Walter against the original foundation material. These turf growers are providing consumers with a product that cannot claim an Original Breeder Guarantee. As a result, these growers are using deceptive means to promote their product, making similar claims and imagery to confuse consumers into thinking that their product has this guarantee.